There's life after Saujana, for sure. Former Johor Menteri Besar Ghani Othman is headed for Sime Darby, the massive transnational corporation, as its chairman. Overheard today in Bangsar, a politician was telling the soft-spoken Malay gentleman, "Half the world is yours now, Datuk." The last Sime Darby chairman is also a Johorean, Tun Musa Hitam, a former deputy prime minister. Old BN politicians never fades away...they get plum jobs that pays handsome salaries..this is Malaysia boleh like the Sun Nades say. A plum job for losing the election . Is there no such thing retirement for UMNO politicians . It's heads I win and tails you loose . Cheeeeesh ! bila pulak Rocky nak dapat 'Chairmanship' ? With due respect to Ghani, why must all the Government owned MNCs always anointed Malay candidates to be the Chairman and CEO. Has the BN Government ever considered the aspiration and the feeling of the other 40% of non-Malay Malaysians including non-Malay Bumiputra, Chinese, Indians and others. What a racist and sickening Government that is rotten to the core. If you don't like the way it's done here, pergi lah berambus! At least Malaysia has one less non-Malay/Muslim. I think you are a cHINAkui! It's better lah you migrate elsewhere as we want to get rid as many cHINAkuis from Malaysia as possible! Lu olang punya bangsa banyak biadap dan kurang ajar! Firstly I would like to refute that Ghani Othman didn't lose the Gelang Patah seat on a fair playing field. More than 90% of the Chinese community went against their political will to vote for Lim Kit Siang who was playing the racist card from day one of their campaign in Gelang Patah. Now that the 13th general election is over, they have voiced their concern and regret that their MP will not be at their service in order to resolve their local problems and issues. This is the truth and there is no denial about the political mistake which the people of Gelang Patah had made and they should not blame Ghani Othman or BN who should perhaps teach the voters a bitter lesson for what they had done to deny the majority of the residents of their right to get a BN representative to serve their needs. As a Johorean, I am happy that Ghani Othman had been given the opportunity to head Sime Darby as the new Chairman. Ghani has the right Federal connection and support to provide the strong leadership and continue to develop and steer Sime Darby in the right direction, both in terms of local, regional and international investments of the most important GLC in the country. Congratulations to my friend Ghani Othman and I wish him greater success and achievement in his new endeavor. 3090This is the reason why Malaysia is in deficit and fast going bankrupt ? All mega businesses are managed by politicians who failed in their elections. I guess this is how Najib bribed UMNO warlord like Ghani Othman for full support from Johor members during the upcoming UMNO election. ALi Rustam nak letak mana? You Pakatoon sore losers. its our time to eat. you get to watch. Aku pun amat berharap mantan orang besar umno/kerajaan tolak tawaran Chairmanship ni. Masa anda dah lepas and you also can afford 1 st class ticket to overseas. Biar glc runs by peoe yg tak merasa jadi memteri besR dan menteri kabinet. Datuk Ghani is the right choice for Sime Darby. Why don't u ask "Why the Chinese take most of our share in our economy"? Why don't u ask "Why the Chinese towkays in Sarawak take all our timber"? Datuk Ghani deserves the chairmanship of Sime Darby.Johore developed tremendously during his tenure as Chief Minister. eat your heart out man......the chinese have made their choice and now live with it for the next five years. Your business will be affected for sure and go and pray to your TOKONG Lim...lick his boots and his arse.....see if that can make you guys rich!!!! Bwahahahaha....in your face man! I laugh gooleeng, gooleeng at what you wrote. You kiasu people tried to vote the malays out of power.....now who's eating their heart out? So, better get out of our sight, therefore out of our mind....menyemaaak je! You must Chinese racist pig.Get the hell out of here. How do you justify asking Michelle Yeoh not to support government!!! You mean DAP have the rights over all the Chinese in Malaysia??? Let's see what Sime Darby will do when it's plantations in Indonesia get hung out to dry by the Indonesian authorities. It's quite possible that Ghani was eased into the "hot seat" at Sime Darby after all. And Sime's financials? How do they compare against it's world-class peers? Oh, btw - did Ghani leave the Johor state government in a budget surplus or budget deficit situation? Which is why all these comments by Pe'ah and the other Anons are laugheably pathetic. One suspects that these wankers are nursing the mother of all inferiority complexes, marked by a pathological aversion to competition, hard work and meritocracy. Long may they live and prosper in Malaysia because that's only where they can do so. Because This is a MALAY/MUSLIM MAJORITY COUNTRY WIN BY MALAY /MUSLIM VOTE..BECAUSE MAJORITY CINABENG VOTE go to PR.. so Its wise to appoint MALAY/MUSLIM to all gov link companies..
TERESA KOK DOES NOT AGREED THAT ISLAM IS MALAYSIAN OFFICIAL RELIGION..
Tabung Haji will also get new Chairman effective 1 July 2013. He is no other than BigDog's No 1 Idol, Azeez Mat Rempit Rahim with MBA from "top" university in USA. PM and RM have been very busy planting their kaki bodeks in GLCs. The happiest person on earth over Ghani's appointment is Lim Kang Ho Ho Ho. Now this pukimak can screw Sime Darby to the max just like he did to KPRJ and IIB. This is my first time commenting on this blog. First, Sime Darby appointed Tun Musa Hitam as the Chairman of Sime Darby. He ran the company to the ground. Now comes Ghani Othman. 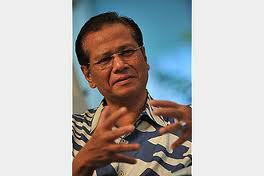 Here is a man who during his tenure ensured that year on year Johor had a deficit. Here is a man who could not turn around KPRJ and assigned half of Johor to the clutches of Kazanah who in turn made on man the de facto Menteri Besar of Johor. As a Johorean, I can dare say no Menteri Besar did a greater disservice to the Malays than Ghani Othman. Just see how much land has Malays sacrificed. What exactly has the ordinary Malays benefitted from Ghani Othman. All he did was that he cultivated an image of a great Malay gentleman. Today instead of appointing a competent and dynamic visionary Malay to lead and chart Sime Darby and trust me there are many, the government present a retirement plum job to a loser. It can be assured that Sime Darby will under Ghani Othman be a GLC alright. Government Loss-Making Company. "Oh, btw - did Ghani leave the Johor state government in a budget surplus or budget deficit situation?" Obviously you do not understand Economics 101. Budget surplus does not necessarily mean it is good for the country!!! You Red Bean Army just follow the band-wagon started by that stupid Rafizi!! !